Today is the 36th anniversary of the historic eruption of Mount St. Helens in Washington State, USA. The May 18, 1980 eruption was a rare type of volcanic eruption known as a lateral blast. 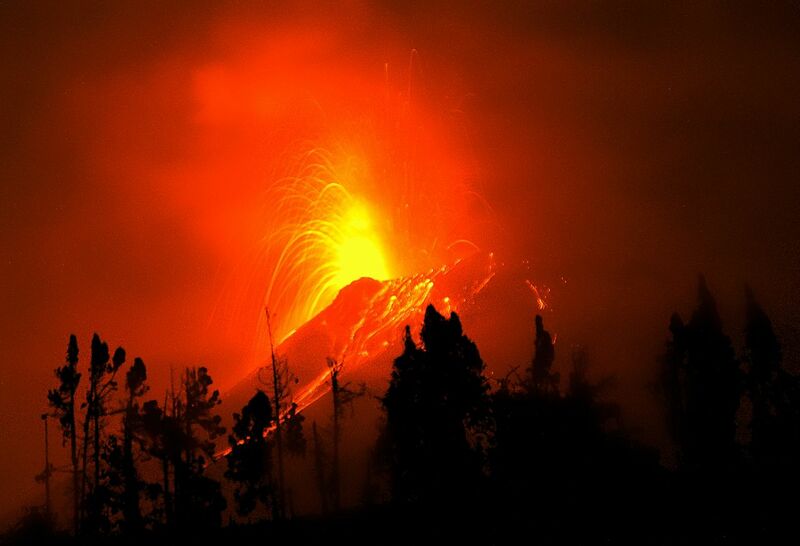 Most explosive volcanoes throw material upwards in an eruption; in the case of Mt. St. Helens the eruption occurred horizontally, releasing pent-up pressure inside the volcano. The eruption obliterated the entire north side of the volcano and resulted in the largest debris avalanche in recorded history. The 1980 Mt. St. Helens eruption played an extremely important role in improving our understanding of volcanic eruptions and the magma plumbing system beneath volcanoes. It was the first time pyroclastic flows – clouds of super hot gas, ash and rock that move at hundreds of miles per hour – were studied using modern scientific techniques. Even now, 36 years later, scientists are still publishing new and interesting insights gleamed from the 1980 and later eruptions. The volcano is still very much alive today. In recent decades a new volcanic cone has developed in the central crater. Thankfully, scientists from the United States Geological Survey (USGS) are keeping a close eye on the volcano and will hopefully provide warning if a new eruption is imminent. See how Earth’s 1000+ active volcanoes were formed in this great national Geographic video. The mess of rocks, mud, water and debris left behind on the ground in a landslide is the outcome of a set of processes (e.g., rainfall, ground shaking, erosion). So, to find a landslide, one must actively search for it across a landscape – e.g., by traipsing about in the field, or searching through aerial imagery. It can take teams of geomorphologists literally years of work to create a thorough inventory of landslides from aerial images. Old newspapers contain a wealth of information on the location of landslides and their impact on communities. One common way to supplement records of landslides is to use human records, such as newspapers, photographs and diaries. Two excellent examples are (i) Dave Petley’s global fatal landslide database, which uses online news to record deaths caused by landslides, and (ii) the Italian AVI project has records of landslides going back hundreds of years from newspapers. Yet when searching the literature, we noticed two things – firstly, people aren’t doing this for Great Britain and secondly, people weren’t really talking about how they searched the newspaper archives. I was lucky enough to receive a NERC-EPSRC internship to work with the British Geological Survey on searching the Nexis UK Digital Archive of regional newspapers to try and find articles about landslides. The first step was experimenting to create a systematic search strategy to be sure that we were picking up as many articles about landslides, and as few articles about things like “landslide victories” as possible. Once this was settled, I applied our search to the Nexis UK archive (thank goodness this is digital and I didn’t have to flick through dusty old newspapers!) and started reading through the thousands of articles returned. When I found an article about a landslide, I would try to extract as much information as possible, such as the timing, location, size and impact. I would then compare this to what was already in the BGS National Landslide Database to see if we were adding in more detail. To our surprise, this method was really effective and we increased the number of records in the database between 40% – 122% depending on the year examined. These additional records help us to better understand when, where and why landslides occur in Great Britain, and what kinds of impact they can cause.